Everyday items that have no place in recycling bins, such as soiled nappies and empty aerosol cans, are still being chucked in them by residents – much to the frustration of local councils, one of which is taping people’s bins shut as a result. Last July, China announced that it would no longer buy Australia’s waste and so now governments across the country are looking for alternative ways of disposing of rubbish. In Denmark, Western Australia, about 420 kilometres south-east of Perth, about 40 per cent of the recyclable rubbish now ends up in landfill. It’s common knowledge that glass bottles and jars, cardboard, shredded paper, aluminium and steel cans and plastic bottles are fine to recycle. However, it seems many residents are unaware that items including nappies, aerosol cans, clothes, flexible plastics, textiles and garden waste should never be placed in recycling bins. 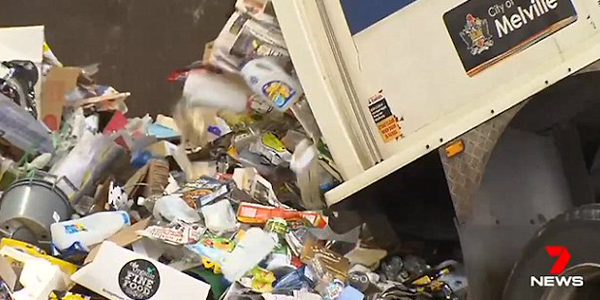 A solution is being looked at to help people understand what can and can’t go in recycling bins. A pilot version of a bin-tagging program was launched in 2015 by the Western Australian Local Government Association (WALGA) with the cities of Joondalup, Kwinana and the Town of Cambridge taking part. The program provides feedback on what is in your bin as auditors take a look inside and assess the content. A tag is then placed on the bin letting the property owners know how they scored. Those who don’t comply with the bin tagging after receiving warnings will have their bin taped shut or their rubbish not collected. In previous runs of the program there was an increase in correct separation with 70 per cent of homes doing the right thing. ‘If, following the taping of the bin, the household’s behaviour does not change, then it is up to the Local Government to determine the next step,’ the WALGA guidelines read. Peter Caron, Denmark deputy president and chairman of the shire’s waste committee, told The West Australian: ‘I think some people are cramming everything in their recycling in the hope it can be recycled, or they’re just not fussed.